Indeed Assessments is primarily a remote team and that makes it harder to keep a pulse on how the team is feeling. Our team of software engineers and IO psychologists is 50 people strong and only 15 of those sit in one of Indeed’s offices in Austin, SF, Seattle, and NY. We get together twice a year for a full team offsite and each subteam gets together in Austin once a quarter, but day to day it’s harder to get those signals we take for granted to tell us if the team’s feeling energized, upset, happy, or bored. Six months ago, I decided to start doing periodic team surveys. Having been the recipient of many long, boring surveys that I ignored, I wanted to keep the surveys short. Bonus credit if they ran on an automatic schedule so that I wouldn’t have to remember to send them. We found TinyPulse. It queues up a single question per week like “How well are you recognized when you do good work?” or “Do you have all the tools you need to be successful in your role?”. Each question is unique except for “How happy are you at work?”, which repeats once a month so that you can see trends over time. For me, the killer feature is that the survey gets sent by both email and Slack. It takes literally 5 seconds to respond in Slack, so our weekly response rates have been holding steady between 65-80%. Yup! A weekly survey with a 75% response rate! Some questions directly alert me to a problem. When we asked, “How well are you recognized when you do good work?” the average score was 6.5/10 with several 2s and no 10s. It rang true: in the back of my mind, I was aware that I had a tendency to immediately jump into constructive feedback on a piece of work without celebrating it, even if the overall body of work was good. We met with the team leads to discuss the feedback, and we agreed to try to change our habits. We also added a “cheers” time to our biweekly all hands purely for manager to publicly call out people on their team for routine work done well. It seems obvious but we weren’t doing it. Occasional shout-outs in meetings are great, but I think we need a way to recognize more ongoing/high-level/broader scope projects/contributions that aren’t easily quantifiable on a weekly or bi-weekly basis. Comments like those are perhaps even more valuable than the numeric scores. The anonymous messaging lets me start a conversation with someone. I try to not to ask for too many details because I don’t want to de-anonymize the sender or discourage them from giving honest scores in the future. The private messages like this let us dig in to understand the nuance behind the numbers and when a survey response sounds like a cry for help, we can actually answer. Once the survey has finished, I forward the “results” email to the team distribution list. Sometimes I’ll hide comments from the report that reveal the identity of the writer, but usually I can send them as-is. 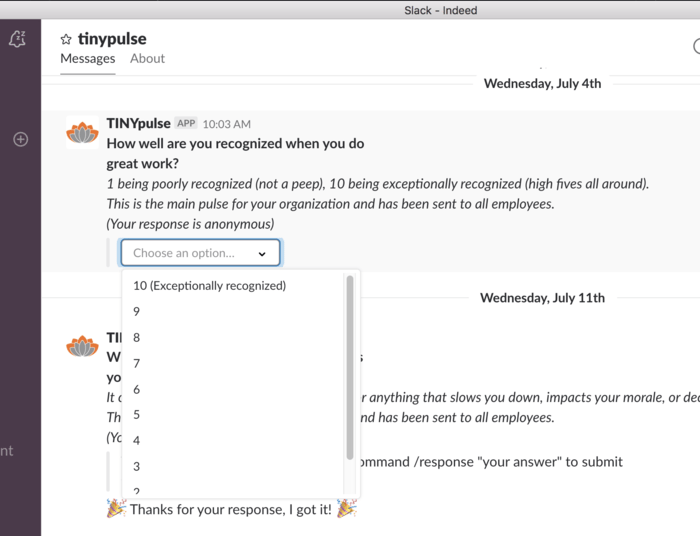 In short, TinyPulse has become an indispensable tool for understanding and helping our team, without ever needing to remind anyone to “Please complete the survey”. Newer PostWhen to avoid Slack... and meetings.